Facebook location check-in is the hot trend among apps on all platforms. 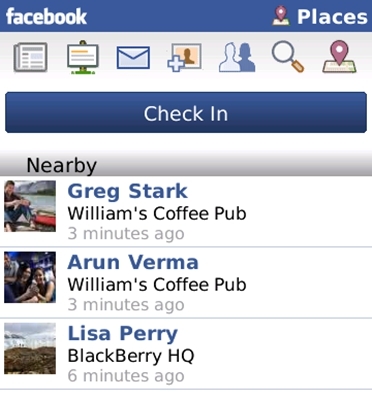 According to the BlackBerry blog, the Facebook app for BlackBerry now has support for location check-ins. The updated app should be available from BlackBerry App World within 24 hours from announcement. Using the Facebook for BlackBerry app, you can check-in locations within 2 Kilometers and you can see where your friends are checking in around you. Facebook Places: You can now share your location with your friends using Facebook Places. Messages list: You can now view your Facebook messages list. Searching: You can now search Facebook for people and pages. Friends and Pages screen: The friends list has been redesigned and you can now view your Pages list from the Friends screen.